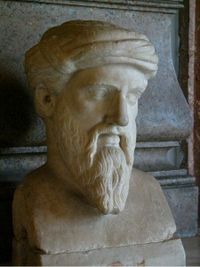 Pythagoras of Samos ( Greek: Πυθαγόρας; circa 582 BC – circa 507 BC) was an Ionian ( Greek) mathematician and philosopher, founder of the mathematical, mystic, religious, and scientific society called Pythagoreans. He is best known for the Pythagorean theorem which bears his name. Known as " the father of numbers", Pythagoras made influential contributions to philosophy and religious teaching in the late 6th century BC. Because legend and obfuscation cloud his work even more than with the other pre-Socratics, one can say little with confidence about his life and teachings. We do know that Pythagoras and his students believed that everything was related to mathematics and, through mathematics, everything could be predicted and measured in rhythmic patterns or cycles. Pythagoras was one of the first to speculate that human life begins with a blend of male and female fluids, or semens, originating in body parts (Enyclopaedia Britannica). This important idea thus gave forth the idea that genetics and heredity required a blend of male and female bodies to form new life. Pythagoras was born on the island of Samos (Greek East Coast), off the coast of Asia Minor. He was born to Pythais (his mother, a native of Samos) and Mnesarchus (a merchant from Tyre). As a young man, he left his native city for Crotone in Southern Italy, to escape the tyrannical government of Polycrates. According to Iamblichus, Thales, impressed with his abilities, advised Pythagoras to go to Memphis in Egypt and study with the priests there who were renowned for their wisdom. He also was discipled in the temples of Tyre and Byblos in Phoenicia. It may have been in Egypt where he learned some geometric principles which eventually inspired his discovery of the theorem that is now called by his name. This possible inspiration is presented as an example problem in the Berlin Papyrus. Upon his migration from Samos to Crotone, Pythagoras established a secret religious society very similar to (and possibly influenced by) the earlier Orphic cult. 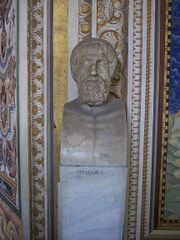 Pythagoras undertook a reform of the cultural life of Crotone, urging the citizens to follow virtue and form an elite circle of followers around himself. Very strict rules of conduct governed this cultural centre. He opened his school to male and female students alike. Those who joined the inner circle of Pythagoras's society called themselves the Mathematikoi. They lived at the school, owned no personal possessions and were required to assume a vegetarian diet. Other students who lived in neighboring areas were also permitted to attend Pythagoras's school. Known as Akousmatics, these students were permitted to eat meat and own personal belongings. The history of the Pythagorean theorem that bears his name is complex. Whether Pythagoras himself proved this theorem is not known, as it was common in the ancient world to credit a famous teacher with the discoveries of his students. 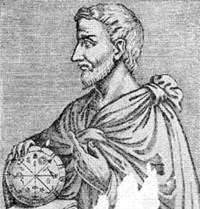 The earliest known mention of Pythagoras's name in connection with the theorem occurred five centuries after his death, in the writings of Cicero and Plutarch. It is also believed that the Indian mathematician Baudhayana discovered the Pythagorean Theorem around 800 BC, about 300 years before Pythagoras. Today, Pythagoras is revered as a prophet by the Ahlu l-Tawhīd or Druze faith along with his fellow Greek, Plato. According to myth, he died at the hands of a soldier, because he refused to trample a bean-field while fleeing. Pythagoras's followers were commonly called "Pythagoreans." For the most part we remember them as philosophical mathematicians who had an influence on the beginning of axiomatic geometry, which after two hundred years of development was written down by Euclid in The Elements. The Pythagoreans observed a rule of silence called echemythia, the breaking of which was punishable by death. This was because the Pythagoreans believed that a man's words were usually careless and misrepresented him and that when someone was "in doubt as to what he should say, he should always remain silent". Another rule that they had was to help a man "in raising a burden, but do not assist him in laying it down, for it is a great sin to encourage indolence" and they said "departing from your house, turn not back, for the furies will be your attendants" this axiom reminded them that it was better to learn none of the truth about mathematics, God, and the universe at all than to learn a little without learning all. (source The Secret Teachings of All Ages Hall, Manly P.). In his biography of Pythagoras (written seven centuries after Pythagoras's time) Porphyry stated that this silence was "of no ordinary kind." The Pythagoreans were divided into an inner circle called the mathematikoi ("mathematicians") and an outer circle called the akousmatikoi ("listeners"). Porphyry wrote "the mathematikoi learned the more detailed and exactly elaborate version of this knowledge, the akousmatikoi (were) those which had heard only the summary headings of his (Pythagoras's) writings, without the more exact exposition." According to Iamblichus, the akousmatikoi were the exoteric disciples who listened to lectures that Pythagoras gave out loud from behind a veil. The akousmatikoi were not allowed to see Pythagoras and they were not taught the inner secrets of the cult. Instead they were taught laws of behaviour and morality in the form of cryptic, brief sayings that had hidden meanings. The akousmatikoi recognized the mathematikoi as real Pythagoreans, but not vice versa. After the murder of Pythagoras and a number of the mathematikoi by the cohorts of Cylon, a resentful disciple, the two groups split from each other entirely, with Pythagoras's wife Theano and their two daughters leading the mathematikoi. Theano, daughter of the Orphic initiate Brontinus, was a mathematician in her own right. She is credited with having written treatises on mathematics, physics, medicine, and child psychology, although nothing of her writing survives. Her most important work is said to have been a treatise on the principle of the golden mean. In a time when women were usually considered property and relegated to the role of housekeeper or spouse, Pythagoras allowed women to function on equal terms in his society. The Pythagorean society is associated with prohibitions, such as not to step over a crossbar, and not to eat beans (for the inside of beans contain embryos like humans). These rules seem like primitive superstition, similar to "walking under a ladder brings bad luck," rules one cannot help but sneeze at. The abusive epithet mystikos logos ("mystical speech") was hurled at Pythagoras even in ancient times to discredit him. The key here is that "akousmata" means "rules," so that the superstitious taboos primarily applied to the akousmatikoi, and many of the rules were probably invented after Pythagoras's death and independent from the mathematikoi (arguably the real preservers of the Pythagorean tradition). The mathematikoi placed greater emphasis on inner understanding than did the akousmatikoi, even to the extent of dispensing with certain rules and ritual practices. For the mathematikoi, being a Pythagorean was a question of innate quality and inner understanding. Beans, black and white, were the means used in voting. The maxim "abstain from beans" was perhaps nothing more than an exhortation to not vote. If true, this would be an excellent example of how ideas can be distorted when heard second hand and taken out of context. There was also another way of dealing with the akousmata — by allegorizing them. We have a few examples of this, one being Aristotle's explanations of them: "'step not over a balance', i.e. be not covetous; 'poke not the fire with a sword', i.e. do not vex with sharp words a man swollen with anger, 'eat not heart', i.e. do not vex yourself with grief," etc. We have evidence for Pythagoreans allegorizing in this way at least as far back as the early fifth century BC. This suggests that the strange sayings were riddles for the initiated. The Pythagoreans are known for their theory of the transmigration of souls, and also for their theory that numbers constitute the true nature of things. They performed purification rites and followed and developed various rules of living which they believed would enable their soul to achieve a higher rank among the gods. Much of their mysticism concerning the soul seem inseparable from the Orphic tradition. The Orphics advocated various purifactory rites and practices as well as incubatory rites of descent into the underworld. Pythagoras is also closely linked with Pherecydes of Syros, the man ancient commentators tend to credit as the first Greek to teach a transmigration of souls. Ancient commentators agree that Pherekydes was Pythagoras's most intimate teacher. Pherekydes expounded his teaching on the soul in terms of a pentemychos ("five-nooks," or "five hidden cavities") — the most likely origin of the Pythagorean use of the pentagram, used by them as a symbol of recognition among members and as a symbol of inner health (ugieia). It was the Pythagoreans who discovered that the relationship between musical notes could be expressed in numerical ratios of small whole numbers (see Pythagorean tuning). He discovered that by using the ratio 3/2 one could translate musical notes into mathaematical equations. Pythagoras was interested in music and the Pythagoreans were musicians as well as mathematicians. He wanted to improve the music of his day, which he believed was not harmonious enough and was too chaotic. According to legend, the way Pythagoras discovered that musical notes could be translated into mathematical equations was when he was walking some day and he passed by some blacksmiths, he heard their anvils being hit and thought that the sounds they made were beautiful and harmonious and decided that whatever scientific law caused this to happen must be a mathematical law that could be applied to music. He went to the blacksmiths to learn how this had happened by looking at their tools. He discovered that it was because the anvils were "simple ratios of each other, one was half the size of the first, another was 2/3 the size, and so on." The Pythagoreans elaborated on a theory of numbers the exact meaning of which is still debated among scholars. No texts by Pythagoras survive, although forgeries under his name — a few of which remain extant — did circulate in antiquity. Critical ancient sources like Aristotle and Aristoxenus cast doubt on these writings. Ancient Pythagoreans usually quoted their master's doctrines with the phrase autos ephe ("he himself said") — emphasizing the essentially oral nature of his teaching. Pythagoras appears as a character in the last book of Ovid's Metamorphoses , where Ovid has him expound upon his philosophical viewpoints. Pythagoras or in a broader sense, the Pythagoreans, allegedly exercised an important influence on the work of Plato. According to R. M. Hare, his influence consists of three points: a) the platonic Republic might be related to the idea of "a tightly organized community of like-minded thinkers", like the one established by Pythagoras in Croton. b) there is evidence that Plato possibly took from Pythagoras the idea that mathematics and, generally speaking, abstract thinking is a secure basis for philosophical thinking as well as "for substantial theses in science and morals". 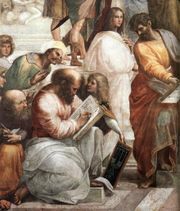 c) Plato and Pythagoras shared a "mystical approach to the soul and its place in the material world". It is probable that both have been influenced by Orphism. Plato's harmonics were clearly influenced by the work of Archytas, a genuine Pythagorean of the third generation, who made important contributions to geometry, reflected in Book VIII of Euclid's Elements. Pythagoras started a secret society called the Pythagorean brotherhood devoted to the study of mathematics. This had a great effect on future esoteric traditions such as Rosicrucianism and Freemasonry, both of which were occult groups dedicated to the study of mathematics, and both of which evolved out of the Pythagorean brotherhood. The mystical and occult qualities of Pythagorean mathematics are discussed in a chapter of Manly P. Hall's The Secret Teachings of All Ages entitled Pythagorean Mathematics. Pythagorean theory was tremendously influential on later numerology, which was extremely popular throughout the Middle East in the ancient world. 8th century Islamic alchemist Jabir ibn Hayyan, inventor of numerous important chemical processes still in use today, grounded his work in an elaborate numerology greatly influenced by Pythagorean theory. "Learn to be silent...Let your quiet mind listen and absorb..."